You always have to approach a film with great trepidation, when you find out the directors' - Greg and Colin Strause - only previous film was Alien Vs Predator 2. 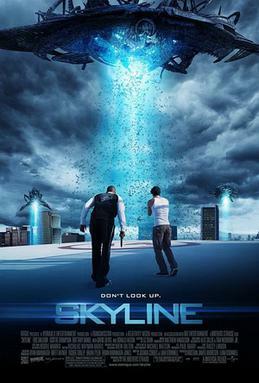 With three years to hone their film-making skills and learn from their mistakes, one can only hope their follow-up, Skyline, would fare much better. Unfortunately, it doesn't. After a night of shallow partying in a Los Angeles penthouse, a group of friends wake up in the middle of the night to find the human race being sucked up to the heavens by a strange blue light. While trying to survive the strange and rather grotesque symbiotic aliens, the central character - played by Eric Balfour - who had been exposed to the light previously, starts to undergo a rather misleading transformation. Oh, where to start? Yes this film was bad. So bad I think Michael "f''n" Bay probably could have done a better job. Which is a shame because on paper it could have been a lot of fun in a similar vein to the brilliant 90s smash hit, Independence Day. Skyline faltered mainly from being a confused and soulless tale, once again the Strause brothers emphasised their lack of film-making talent in comparison to their impressive special effects artistry. If the film's entire plot had been condense into about 45 minutes, it would have been an intriguing first act to a ballsy alien vs mankind galactic war. Unfortunately once the film starts to gain a bit of steam it just ends inexplicably, with little or no explanation to the alien's origins, their weakness or if there is any genuine hope for the human race. This isn't helped by the faceless cast on hand who, with the exception of Turk from Scrubs (Donald Faison), are probably doomed for a career making 'Straight-to-DVD' features in the years to come. Akin to a wealth of 80s and 90s horror films, they were mostly young, good-looking and met rather distasteful ends. I always stress I'm never looking for breathtaking Oscar winning performances from these kind of affairs, but at least put some effort into it. The shining light from Skyline (no pun intended I assure you) and the only thing keeping it from being condemned to the bargain bin at Tesco (even then I don't fancy its chances) is the rather impressive and well imagined, enigmatic, alien creatures. However, similar to the Strause brothers début effort, they take the horrific violence to, frankly, needless levels, coming across more as an extra terrestrial survival horror, which is fine, but fails to create the atmospherics which made the likes of Ridley Scott's Alien or Paul WS Anderson's Event Horizon so undeniably chilling. Well it wasn't quite on the sh*t scale of Battlefield Earth but with a lesser budget it might well have been. Yet again Colin and Greg Strause demonstrate their directorial shortcomings with some less than average storytelling which fails to match their ambitious, albeit, fanboy special effects. Do us all a favour chaps, stick to what you're good at and leave the directorial duties to more capable souls. No, just don't see this at all!